So to celebrate the awesomeness of cheat days, here’s a round-up of things that make me go mmmmmm and have me living for the weekend! Kohr Brother’s Frozen Custard. 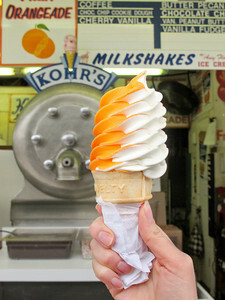 Move over Rita’s because Kohr Brother’s orange and vanilla swirl frozen custard is my favorite sweet treat in the summertime. No visit to Seaside Height’s boardwalk is complete without an orange swirl cone with rainbow sprinkles. Three Brother’s Pizza. 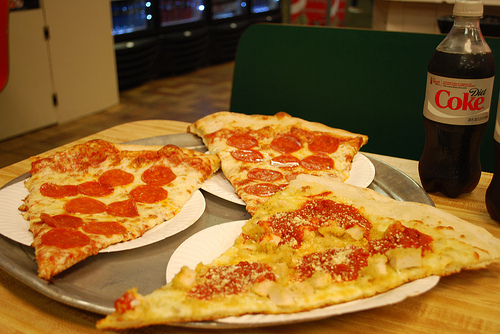 Another Seaside Height’s staple, Three Brother’s Pizza makes giant delicious pizzas loaded with delicious flavor. My personal favorite is the white pizza with fresh tomatoes and garlic. One slice is a meal in itself! This is a treat I do not get to enjoy often enough. Udon noodle bowls are so lovely. Packed with various meats and veggies, this is more than just a bowl of soup. 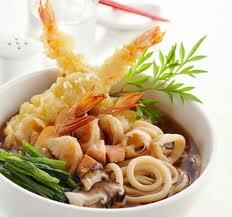 Japanese udon noodles are made with wheat flour (so un-Paleo) and are usually served in a light broth. 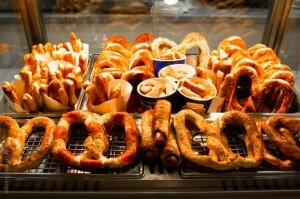 Oh, no visit to the mall is complete without a greasy, salty Auntie Anne’s Pretzel. I always go with the pretzel bites, not to be confused with pretzel sticks, because it makes me feel like they give you more pretzels for your money but I’m probably just insane. This is hands down the greatest breakfast platter in the entire universe. Really. 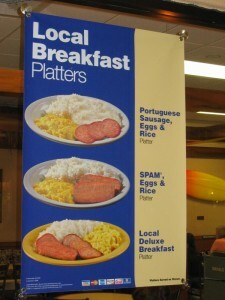 When I was in Waikiki, I could have eaten this for breakfast everyday. Spam is one of my original loves. Packed with enough preservatives to keep it looking young for years, Spam became the stereotypical Hawaiian staple after World War II and now it’s a part of McDonald’s breakfast value menu. My love affair with Spam dates back to my childhood and let me tell you something – I could eat Spam, eggs, and rice every day forever and I would be a happy camper! 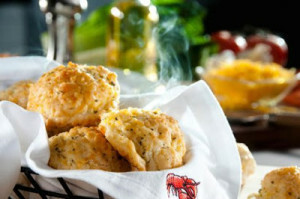 Red Lobster‘s Cheddar Bay Biscuits. Need I say more? These speak for themselves. Little known fact: Wawa’s sausage, egg, and cheese on a croissant is the best croissant-wich out of all the fast food chains. Burger King and Dunkin Donuts have nothing on the buttery croissant, the creamy cheese, and well-spiced sausage. 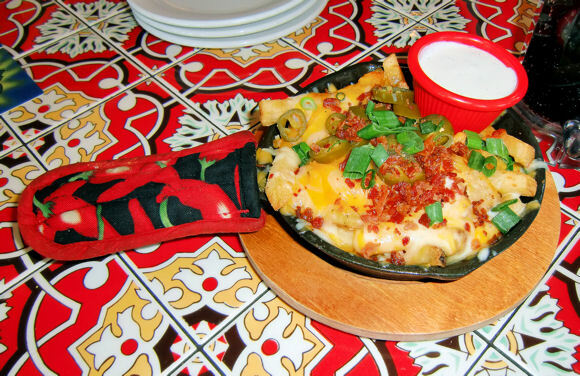 Chili’s cheese fries. 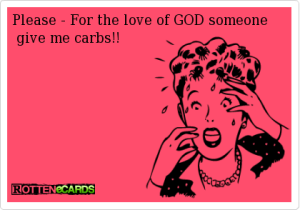 It’s funny how diet changes make you more in-tune with your body. I love, love, love these specific cheese fries. I don’t know if it’s the mix of bacon and jalapenos or the creamy ranch dressing, but Chili’s cheese fries are unmatched. But, every time I indulge in them I get a nasty headache and stomach-ache. Confession: it’s worth the pain because they are so good. 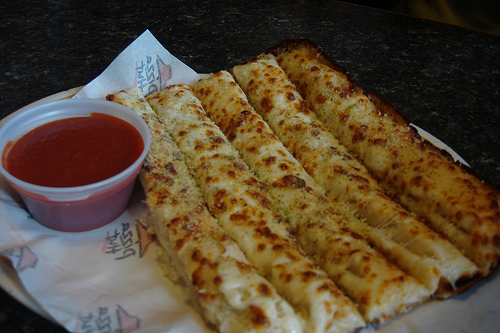 Pizza Hut‘s bread sticks with cheese. I actually hate Pizza Hut – their pizza sauce is too sweet, the toppings are never enough, the crust is cardboardy…I could go on. These bread sticks are their only redeeming quality. 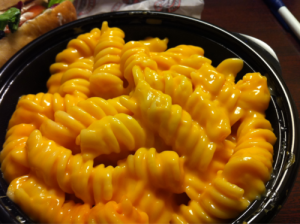 Boston Market’s macaroni and cheese. Creamy, cheesy, salty. Heaven. 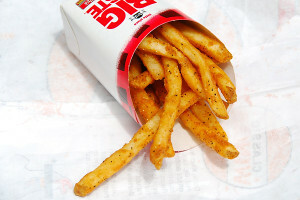 Checker’s french fries. You know what the problem is with most french fries? They lack flavor and crunch. I dare you to find a french fry from checkers that is neither spicy or crunchy. Impossible! And finally, the sandwich that confirms my participation in New Jersey stereotyping, I give you the porkroll, egg, and cheese sandwich. Believe it or not, but it’s hard to find the perfect PEC sandwich. Once you’ve found it, you’ll be loyal to that establishment for life. For me? Porkroll can’t be over-cooked. 2 eggs, scrambled. 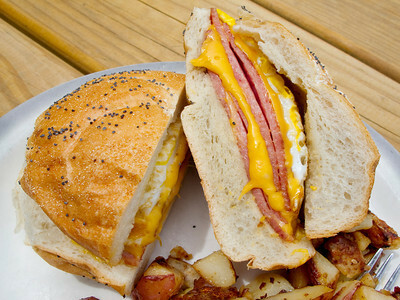 Two slices of cheese between the eggs and porkroll. Kaiser roll must be grilled. The Regent Diner in Howell, NJ was my PEC place. It was always perfectly greasy and well made. Imagine my dismay when the owner sold it to some jerk who turned it into Athena’s Diner. The sandwiches were never the same. And now? It caught fire and has been closed ever since. Take note, New Jersey. I’m accepting applications for my new favorite PEC place! Tasting samples accepted every Saturday! 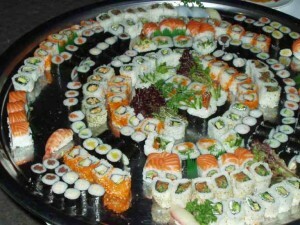 I hope I didn’t make you too hungry, because I’m starving! This Saturday can’t come soon enough! Have an awesome Monday and live Aloha!